Stern Pinball’s The Walking Dead pinball is operated by Games People Play at the Bailey’s on West Broad Street here in Richmond. Stern has been working on getting the code updated from the barebones code that was included with the original release. Once the most recent code, version 1.24 was released, Games People Play was quick to get to the location and get the code updated. To celebrate the new code release, The Walking Dead is the machine for the June location challenge. To participate in the location challenge, take a photograph of your high score on The Walking Dead during June and post it on the RVAPinball Facebook page. The high scorer for the month will receive a $25 gift card for Bailey’s. Here is some gameplay video from the Bailey’s location. The first update you notice in version 1.24 is the siren that goes off when the machine is warning you about a tilt hit. Below the video is the full list of updates included in code 1.24 for The Walking Dead. Added first pass HORDE wizard mode. HORDE is now lit by starting all of the multi-kill modes. instead of automatically when the last multi-kill is started. each time a level is cleared. The first level requires 3 walker kills. The second level requires 4 walker kills, etc. (on top) of the adjacent walkers. Horde scoring now incorporates previous multi-kill mode scores. started, the multi-kill shots are reset. Fish tank heads now show for most lamp effects. high. This has been corrected. Added head impact sounds to the TUNNEL mode award animations. Added gunshot sounds to the BARN mode award animations. them on (+). This has been swapped. by an adjustment -- i.e. this can be turned off). there is no way to relight it once it has been used. Shortened the match animation. Re-synced music. Cleaned up multi-kill animations, added sounds, added light shows. of the speech reflect the scores being awarded. Added lamp effects for BARN/CDC/RIOT/TUNNEL/ARENA mode totals. laps). Because it's not much fun starting over from the beginning. Implemented a better victory lap stage for well multiball. prison walker kills for lighting SIEGE. Added a lamp effects the well walker. bashing the prison walker head has been increased from 4 to 5.
long version is used for the last letter. Added infrastructure for scoring with previous modes played. Reworked scoring for tunnel mode. difficult and confusing, even for seasoned players. Added a setting for blood bath multiball add-a-ball autofire time. are going to spend all day playing blood bath multiball. (i.e. - the left ramp) and there was too much speech. Fixed the priorities for blood bath multiball and crossbow multiball. These were lower than the modes. Added art to multi-kill totals. supplies, lighting modes, and lighting blood bath multiball. Removed "advance prison" from the set of woodbury skill shot awards. was being used for each. This has been corrected. easier. This still needs tweaking. Added bonus score for killing all 115 zombies. zombies killed. 2nd extra ball awarded once instead of multiple times. Hooked in last man standing (light). Added HSTD for last man standing. Added missing sounds to generic walker kill animations. (like the type on the playfield) and the information more clearly. frame when the display effect would exit. Added art to tunnel champion display in the attract mode. Target bank adds more time to the BARN/CDC/RIOT/TUNNEL/ARENA modes. Added art to CDC attract mode HSTD display. than one good award may be lit at a time. from stomping all over an existing (extended) multiplier. sequence being killed after the first group of awards. total to display as garbage if no shots were made that ball. crossbow multiball. This has been corrected. second shooter lane switch, and the top lane rollovers. the title/score on the screen. Added a HSTD for the most walkers killed. Cleaned up the pop bumper jackpot increased award display effect. should not have been). Fixed post-super jackpot scoring. collecting all of the supplies (controlled by adjustments). weak sounds from the skill shot background. Added tilt warning and tilt sounds. after it has been collected (RANDOM, LEFT-TO-RIGHT, RIGHT-TO-LEFT). Competition mode installs the LEFT TO RIGHT setting. there will be a connection to the achievement and the shot lit. mode that started the multi-kill. up the value and light additional shots on the playfield (red arrows). Added art for for the combo champion display in the attract mode. the X champion for HSTD. multiplier. This included combos and bicycle girl. Added flipper button speech to the attract mode. Removed animals from the crossbow mode, per AMC request. Art changed for skill shot walker. rendered last. Smaller walkers move slower and are rendered first. that is the farthest away from the barn. of the on-screen walkers had been killed. This has been corrected. 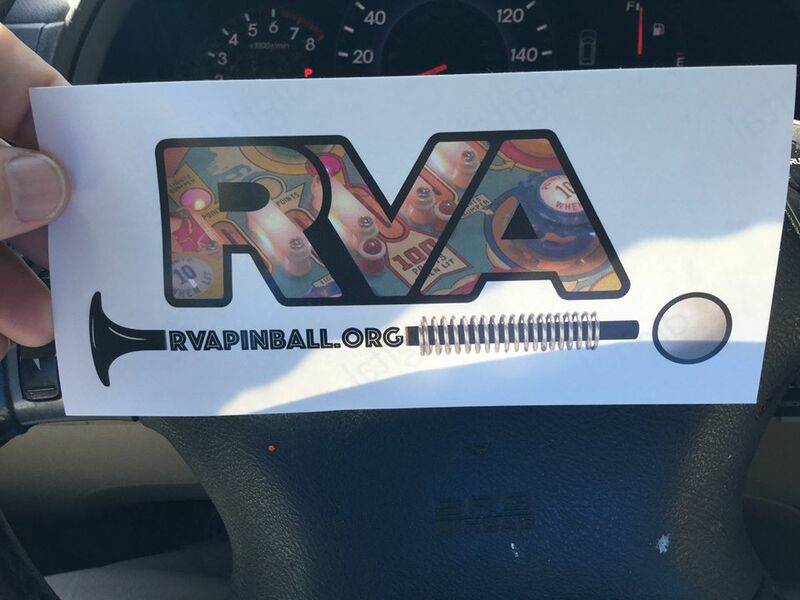 Want to help us spread the word about RVAPinball? Leave a comment here or on facebook/rvapinball with your address and we will send you a sticker. The results of both tournaments have been submitted to IFPApinball.org. I will update once they have been posted with the assigned WPPR points. Thank you to everyone who participated. We raised over $700 and have more to raise if we end up printing more shirts. We need to have pre-orders of at least 13 to do another run. If you would like a shirt, please find the post-tournament t-shirt order thread on facebook.com/rvapinball and post there with your size. Once we go over 13 orders, we will send you a paypal invoice. We had 26 players in the main and over 70 entries in the side tournament. The response and the turn out was great! Isley were great hosts and the member of River City Flippers worked very hard and donated lots of time to make this happen. More to come on a longer post, but for now, enjoy this video of the quarterfinals on Iron Man with Rod Cordoba against eventual Champion Bayless Rutherford. A huge thank you to Style Weekly for the article on the tournament that we have scheduled for this weekend! This past Friday, I made the trip to my second Allentown Pinfest. It was a fantastic and well run show. The main reason that I went to the show was to pick up an Evel Knievel machine that I had bought on pinside with the agreement that I would pick it up at the show. The machine was as described. When I got it home, it fired right up and is working very well. I’ve been wanting one for a while and it was good to bring this one home. There were hundreds of machines at the show and booths featuring various vendors. I was most excited about the chance to play new machines that I had read about, but not been able to play. The Big Lebowski from Dutch Pinball was the first machine I saw when I entered the exhibit hall. The machine is running a very early version of the code and none of the modes could be activated. The lower bowling lane playfield and the flip out car on the upper playfield were both working. I was never able to get the ball into the lower playfield. This turned out to be a good thing because the ball repeatedly got stuck in the lower playfield mechanic requiring a re-start of the machine. The machine looks and plays very well. The flippers are powerful and feel like later Bally/Williams flippers. 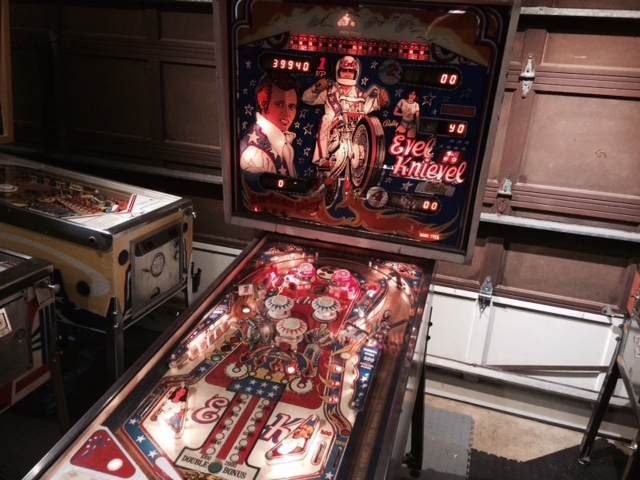 The playfield and cabinet art looks great and looks like it is made of high quality materials. The sound system was very clear and loud with both music and call outs that sounded like they were clips from the movie. The machine is expensive and we have to wait to see how the code turns out, but it was impressive. Just down from The Big Lebowski was the Marco booth which had two of Stern Pinball’s Whoa Nellie Big Juicy Melons. This machine was originally a kit that was used to convert an existing eletro-mechanical machine with new art. There were only four copies of the original machine produced and playfields and back glasses were sold to collectors. To the surprise of many, Stern Pinball decided to produce Whoa Nelly in volume. The first thing that you notice is that it is propped up on a wooden crate instead of being supported on legs. The machines also ship with legs for those who prefer legs. The lockdown bar and side rails are also made of wood which gives it the machine a solid, smooth feeling as you play it. The game had lots of call outs and nice bright LEDs and is much more fun than I expected. The game has the 2″ inch flippers that were common on electro-mechanical machines and they increase the challenge of the game. I enjoy EMs and this was a nice modern update that is really fun to play. The price is way too high at this point, but it is fun. RVApinball.org and River City Flippers are working to prepare for our first tournament in a public location. 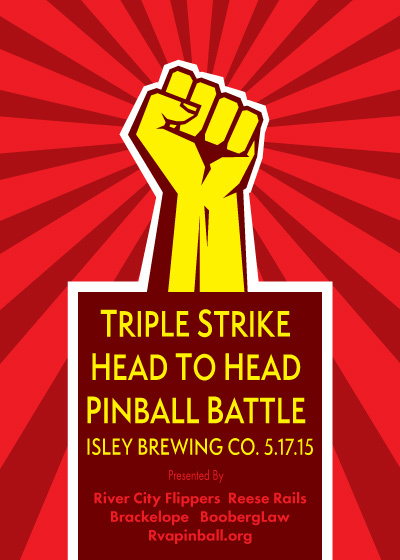 This tournament is going to have privately owned machines moved into the Isley Brewing Company, a fantastic local brewery, that has generously agreed to host our tournament. The tournament format is three strike Swiss Brackelope. On the day of the tournament, you will be able to follow the tournament by going to live.brackelope.com and searching for Isley. The tentative machine lineup is: No Fear, Pinbot, F-14, Indy 500, Whirlwind, World Cup Soccer, Flash Gordon and Iron Man.